Did you know that you could have free phone service with Ooma, even when you’re away from home? If free sounds like a good price to you, read on to find out more. Ooma is a comprehensive VoIP phone service, or more simply, an internet-based phone. This means that rather than transmitting calls through landlines or through a cell phone’s voice network, calls are instead transmitted over the internet. There are pros and cons of VoIP service, but this technology allows us to provide telephone service at rates that are much less than those of typical phone providers. 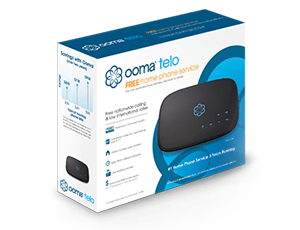 Access to Ooma’s free calling service begins with an Ooma Telo device. Plugged into your home internet router, the Ooma Telo can make calls using the phones you already own. Not all VoIP phone services require this type of hardware to provide phone calls, but here’s why we do. The Ooma Telo, combined with Ooma’s PureVoice technology protocols, allow users to make high-quality phone calls thanks to the behind-the-scenes technology working to help avoid the garbled calls that can occur with other internet phone services. 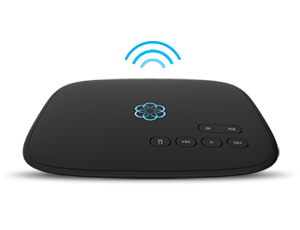 In particular, the Ooma Telo’s wire-speed QoS settings (Quality of Service) are customized to your internet connection so your voice can sound clear, even while your internet has heavy traffic. This advanced technology also includes a proprietary compression algorithm that reduces bandwidth consumption by 60% over standard VoIP technology. The Ooma Telo starts at $99.99, plus between $4 and $7 per month in taxes and fees depending on your postal code, and it can be your gateway to affordable phone service as well as a portal for advanced home security. Following the upfront hardware costs, Ooma’s affordable phone service provides customers with significant savings. On average, our customers save $1,166.73 over three years, and you can use our savings calculator to see the exact amount you’ll save. What’s Included with Ooma’s Free Phone Service? Ooma’s Basic Service includes free calling to all U.S. phone numbers and all other Ooma account holders. You’ll be able to call your neighbor who lives down the road or your cousin who lives across the country. Also included are a range of advanced calling features such as online call logs, call waiting, remote voicemail retrieval, Caller-ID, HD Voice calling, and more. Ooma customers also have access to advanced 911 services that can automatically connect you to your local dispatcher and transmit your home address to emergency services, saving you critical time. Basic customers can also integrate their phone service with the Amazon Echo for hands-free calls places with Alexa. Your Ooma phone service isn’t limited to calls made from within your home. After installing Ooma’s free calling app on your smartphone, you can access your Ooma phone service from wherever you are. Basic customers can use the app to place phone calls while on the go, or to check voicemail. Keep in mind that the app uses your device’s internet connection, so placing calls when connected to Wi-Fi can help you avoid data charges from your cellular provider. To learn more ways that the app helps you stay connected, read 5 Ways That You Can Use Ooma’s Free Calling App. Want More Features and Functionality? Ooma’s free calling service isn’t your only option, and Ooma’s Premier Service offers many more features that are not available to Basic customers. Premier customers have access to advanced tools such as customizable call blocking to help protect against scam calls, voicemail monitoring, multi-ring, Instant Second Line, three-way calling, Google Voice Extensions, smart home integrations, and free calls to Canada, Puerto Rico, and Mexico. Additionally, Ooma Premier customers can use the mobile app for unlimited inbound calling in addition to outbound calling. In other words, you’ll have complete portability with your Ooma phone service. Ooma Premier costs just $9.99 per month on top of the monthly taxes and fees of Basic Service, and there are no contracts or commitments. All Ooma customers can access Ooma’s affordable international calling service to make low-cost calls abroad. Whether placing calls from your mobile device via the mobile app or with your Telo-connected home phone, Ooma’s international calling rates can translate to savings of up to 95% compared to the rates charged by cellular providers. Choose between affordable international calling that costs just pennies per minute, or for more comprehensive access, choose one of Ooma’s unlimited international calling plans. The Ooma World plan costs $9.99 per month for the first 12 months and provides access to landlines in over 60 countries and to mobile phones in over 10 countries. Whether you’re traveling abroad or want to call family living overseas, Ooma makes it easy and affordable to stay connected.